I am a firm believer that food can heal. Not only through the use of ancient Chinese and Indian herbal lore but also in the choices of specific ingredients cooked with love for people with particular ails –both physically and energetically. In my healing practice, when I have a special client who I have both known for a while and worked on consistently, I enjoy making foods that come from a spark of intuitive inspiration for them as a special addendum to a fruitful session. 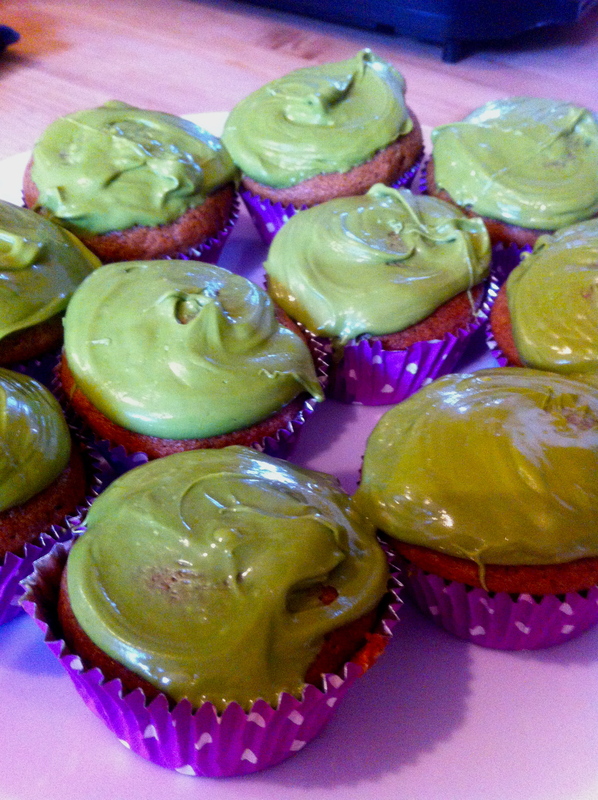 This is why I spent an hour on Sunday afternoon whipping up a forest green-topped cupcake muffin for an Irish lass I know who will be returning from a journey to her home country today and ready for a refill of spiritual and emotional substance. This is no ordinary cupcake muffin. The bottom half, in homage to the feisty Irish blood that colors the hair in hues of red and scatters freckles across the flesh is blended from spices and butternut squash. The top half, in homage to the landscape of the banshees, is a deep smoky green concoction made from white chocolate and matcha. Matcha refers to a fine powder Japanese green tea which doubles as a heavy duty cancer-fighting and fat-burning antioxidant. Because you are ingesting the entire pulverized leaf rather than a decoction from the leaf like with traditional teas, you are getting at least five times the benefits at once. Not only do I love it as a tea sweetened with almond milk and honey, but I love adding it to foods that are creamy and sweet like frostings, yogurt, cheesecakes and melted chocolate. 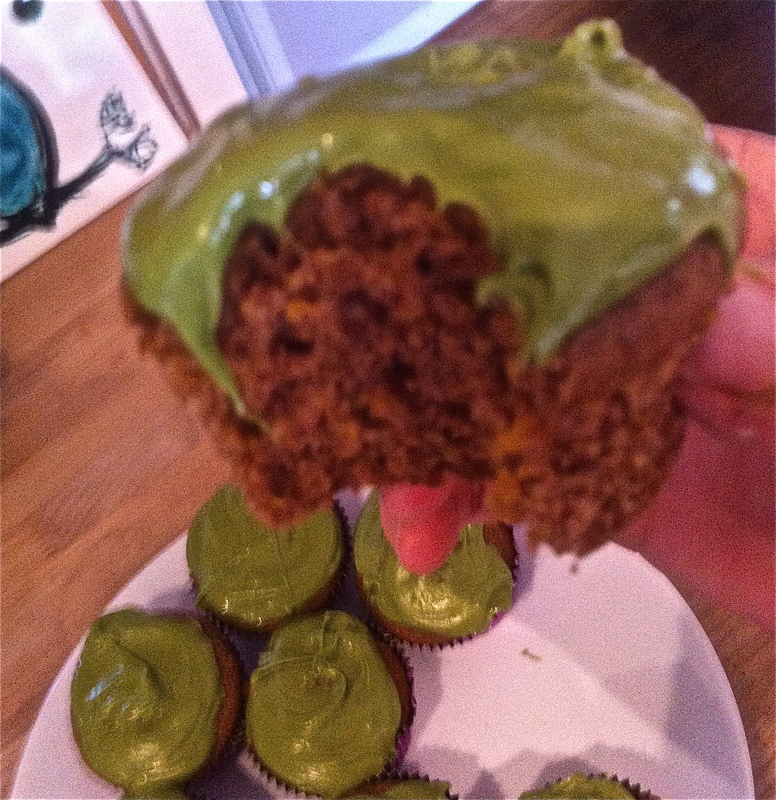 Most of the following recipe was provided by Matcha Source but I made tiny adjustments here and there. The idea of adding a cup of cream for the frosting in a recipe I was creating for healing purposes seemed skewed so I shifted it to becoming a simple chocolate topping rather than the traditional light and fluffy dollop and it worked beautifully and made the cupcake taste like a dense and perfect breakfast-worthy muffin. For dessert or a bright eyed morning starter, this is an equally good match. Preheat oven to 350˚. Put cupcake papers into a muffin tin. In a large mixing bowl, whisk together the flour, baking soda, cinnamon, nutmeg and sea salt. In a separate, smaller bowl, mix the eggs, maple syrup, clarified butter and squash purée. Add the wet ingredients to the dry, mixing until just blended. Spoon the batter into the paper cups, dividing evenly, and bake for 20 minutes or until a toothpick inserted comes out clean. Cool on counter. Melt the white chocolate over low heat, stirring continually. Add the matcha and blend well. Spread over the tops of cooled cupcakes. 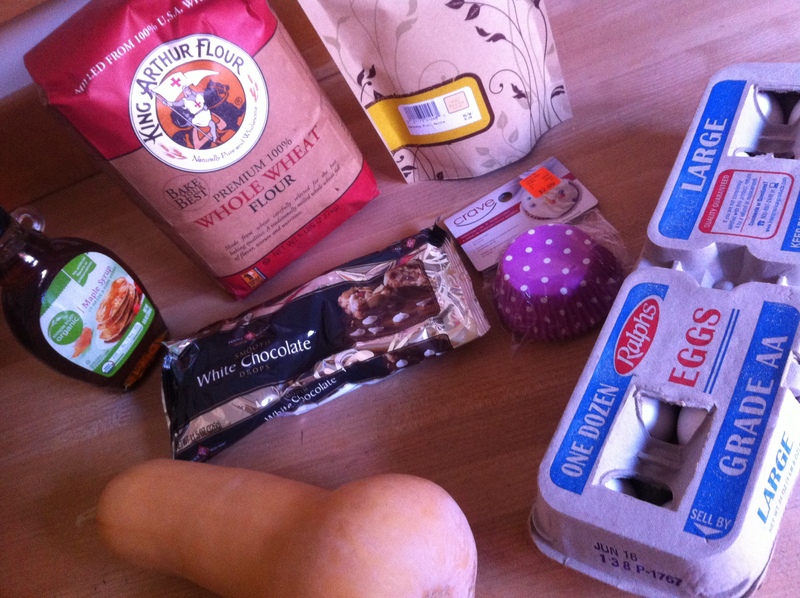 This entry was posted in Through The Stomach and tagged butternut squash cupcakes, healing foods, Japanese green tea powder, Kimberly Nichols, matcha recipes, Unorthodox Foodie by unorthodoxfoodie. Bookmark the permalink. You would love them. Addicting, healthy, delicious. I will make you some since they go great with redheads … we should have a soap and tea and muffin exchange morning sometime. Hi! Have you tried these with GF flour? I know supposedly it can be substituted 1:1 in most cases, but the consistency somteimes changes. Thanks! Hi Karen, I have not but for those gluten-free people I am assuming it would work well. The only thing I would be concerned about in that case is a slight change in consistency. As they stand here, the cake part is like a nice, dense moist pumpkin spice type bread and with a gluten free flour you may want to pump up the amount of organic maple syrup a bit to counteract the GF dryness.